Switching the direction of a staircase can open up a new floor plan. You can, for example, change the direction to leave room for a table or doorway where the bottom of the stairs now fits. Just a few square feet of space can make a lot of difference in a room if you want to widen a doorway or build a new doorway on a blank wall. Many options are available, but envision a landing as the connecting point to add one -- or even two -- changes of direction for the staircase. Changing a staircase requires understanding stair structure. Remove any obstacles for the new staircase footprint. For example, open a wall directly in front of a staircase landing to extend the stairs straight ahead. Take out a closet or room divider to create room for the stairs to angle off to the left or right. Figure out if you will need to alter a window as well, taking into consideration the home's exterior design. Draw the new staircase design before making any cuts on the staircase structure. Sketch precise measurements on graph paper, allowing one square to represent 4 inches of real space. Define the exact point on the stairs to construct a new landing or alter the existing one, so the landing looks appropriate with the overall staircase design. Keep the stair-to-tread ratio on newly-constructed bottom stairs the same as upper stairs. Ask an expert carpenter to assist if you don't know how to use a carpenter's calculator to figure the riser-to-tread ratio. Plug in numbers that correspond with the height of the staircase and its length to find the height of each riser, which is typically around 7 inches, and the width of the tread, which is typically around 10 inches. Build the staircase's basic framework in rough form before remodeling the rest of the surrounding area. Construct the staircase's new footprint to ensure any walls, windows or cabinetry will fit the new staircase layout before you add finished treads or carpeting, for example. Cut the staircase framework at the point to construct a new landing. Make cuts with a circular saw or handsaw to remove the bottom one-half or one-third of the staircase. Construct the landing before adding a new set of stringers and staircase component steps heading in a new direction. Build a supportive structure to hold up the top section of the stairs. Nail 2-by-8-inch boards inside both stringers to form support studs from the last tread to the floor. Do this to hold up the weight while you construct the new landing or alter the one in place. Construct framework for the landing similar to a section of house flooring framework. Install joists to support 1/2-inch plywood sheathing to form the landing. Cut 8-inch square post material to support the landing securely. Bolt the upper and lower stringer sections to the landing and bolt the landing to the house wall framing. Install the lower section of stringers, forming the new staircase direction. Cut 2-by-12-inch boards with a circular saw to create the sawtooth stringers that will hold the stepping treads and risers. Make cuts based on the riser-to-tread ratio figured out on a carpenter's calculator. Install risers, treads and railings to match what's already in place on the upper section of the staircase. Glue hardwood treads in place, for example, and add the exact balusters on the lower section to match upper railings. 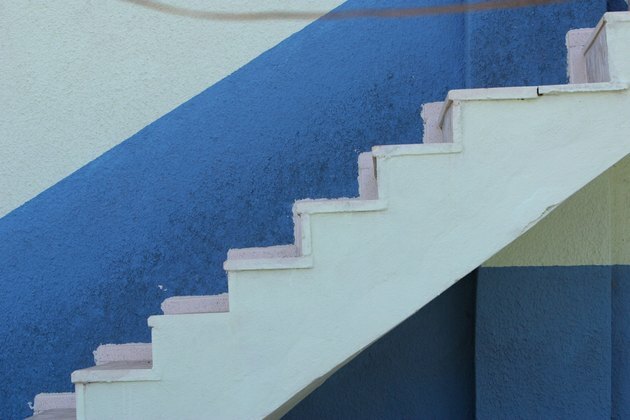 How Do I Fix My Stairs That Are Dangerously Steep?